Boletus edulis, the scientific name for the porcini mushroom, is a great gift to humanity. It is a rich, heady, meaty mushroom that is amazingly versatile, delicate enough to give grace to an elegant stew or sauce, and yet vigorous enough to stand up to something as flavorful as a thick grilled steak accompanied by a good barolo wine, like a good vintage of Ceretto's Bricco Rocche. Fresh porcini are most popularly known to grow in European forests under conifer trees, but they can be found in North America. The French call them cèpes, the Germans call them "steinpilz" or "herrenpilz," and the Russians call them "belyi grib." The word "porcini" actually means "little pig" in Italian. The ancient Romans called them hog mushrooms. Pigs were overly fond of them as a food source (then and now). Porcini mushrooms do not come cheap. And, if you want to get them in season, the short growing seasons reflect the higher cost for a higher quality product. Generally, the fall porcini runs from September to November, and they are available again in March or April for a short spring season until May. "Every year come September, the price of mushrooms drops and I stock up on porcini." —famed Italian food writer Pellegrino Artusi wrote more than a century ago in his 1891 book, "Science in the Kitchen and the Art of Eating Well"
Artusi was talking about drying fresh porcinis to use in stews and sauces during the winter months, but we can be quite certain that fresh porcini mushrooms figured prominently on his table. On average, a pound of dried porcini mushrooms costs about $40 to $60. You can also get a pound of frozen porcini mushrooms for about $20 per pound. You can get them jarred, spiced, and packed in olive oil, too. Price variances depend upon quality. Dried mushrooms will last you longer and can hold the flavor of fresh mushrooms better than frozen mushrooms. Dried porcinis cannot be grilled, but do play an important role in the kitchen, they can be added to stews and sauces and can be used to make an excellent risotto. If you envision a mushroom in your head, porcini mushrooms are probably what you imagine a mushroom should look like. Porcinis have a thick, firm white stalk and a broad, dark-brown cap. If you are out walking in a European forest and come across a clump under a chestnut tree, where they're often found, you may well think you've stumbled into a fairy tale and that gnomes or fairies are nearby. Porcini mushrooms should be firm with unblemished white stalks and brown caps, not nicked or broken. If the undersides of the caps have a yellowish-brown tinge to them, the mushrooms are heading into overripeness, and if they have black spots on them or the under caps are deep green, they're already overripe. The other thing you should look for is signs of worms (small pinholes). Worms like them just as much as humans do. Examine the stalk for small holes. If you find them, stand the mushroom up on its cap and they'll eat their way out of the stem. You may still have to pick out some small worms after chopping. They are harmless and quite common, so if you do accidentally eat a few you'll be fine. When purchasing dried porcini, look them over carefully. If they're crumbly, they're likely old and probably won't have much flavor. If they're sold from a jar, breathe deeply when you open the jar; you should smell a heady mushroom aroma (which is often strong enough to come through the packaging of a packet). If there's no aroma, the mushrooms aren't going to taste like much. 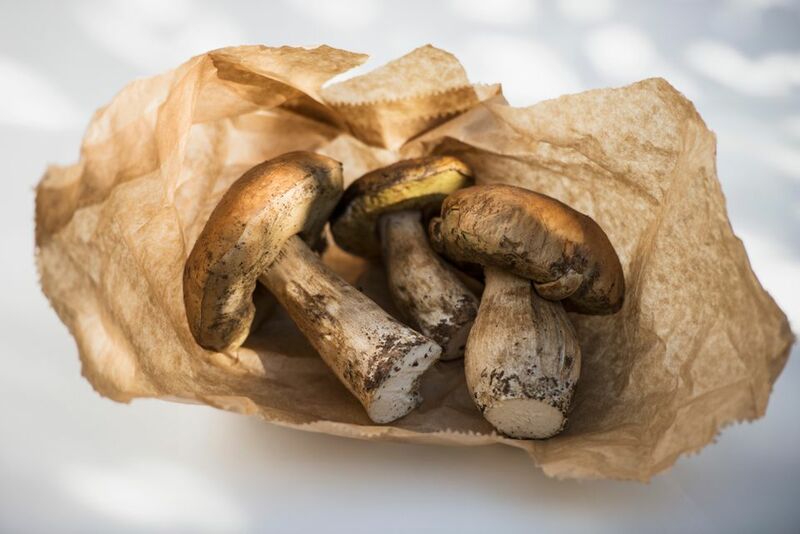 As soon as you get your porcini mushrooms home, scrape any dirt you may find off the stalks and wipe the mushrooms clean with a damp cloth—only wash them if you absolutely must, and then, never in hot water. They are now ready to use. If you plan on doing so immediately, perfect. If, on the other hand, you must wait several hours, either remove the stalks or stand the mushrooms on their caps. If the mushroom has tiny worms, they will eat their way upwards and outwards. In Tuscany, cooks season porcini mushrooms with nepitella, a sort of small-leaved mint with hints of oregano. In other parts of Italy, parsley is used instead. Feel free to use either, or give thyme a try. To prepare dried porcini, steep them in just enough warm water to cover for 20 minutes or until they've softened and expanded. Drain them, reserve the liquid, and mince them. They're now ready for use in the recipe; if the recipe calls for liquid as well, filter the water they steeped in (it may contain sand) and add it too—you'll get lots more mushroomy aroma. One of the most common porcini mushroom recipes is porcini mushroom risotto, a warming fall dish made with dried porcini mushrooms (fresh can be used too). Fresh porcini mushrooms can be grilled, fried, sauteed, and stewed with many flavor combinations.